"It's not just talking at you. It helps you to try and get things off your chest and makes you realise how other people feel when they are angry." Speak Out! has finished for 2018, but we are hoping to bring it back again next year. Speak Out! tours and delivers projects in Secondary Schools and Community Centres in Southwark tackling subject matters affecting young people’s lives. It is run out of Blue Elephant Theatre working with people 16-30 years old, not in Employment, Education or Training to develop their employability, skills and confidence. 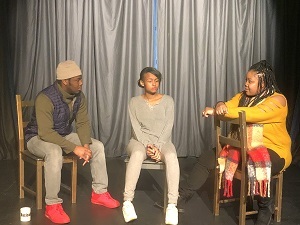 We train participants to become actors, workshop facilitators and creatives in a performance context that can give them transferable skills for any job, utilising a method called Forum Theatre. Forum Theatre is a type of theatre created by the innovative and influential practitioner Augusto Boal as part of what he calls his "Theatre of the Oppressed." Forum Theatre is an interactive performance method that engages an audience to find a positive resolution to a play. The audience are supported by a facilitator who encourages them to intervene in chosen scenes of the play to influence a character’s choices and guide them in a new direction. In Forum Theatre there are no right or wrong answers, just the chance for the audience to work constructively to explore various possibilities and find a positive resolve. This engaging and creative process is an exciting way to work with groups to explore behavior and empower them to make change. Past productions have focused on young people’s experiences and emotions. Speak Out! likes to give young people a platform to explore issues such as, confidence and dealing with anger and the emotions that influence our every day actions and future possibilities. "The students really engaged with the story and characters and the theme of anger was one that all students could relate to in some way. The use of Forum theatre really helped them see how these situations could be easily changed, I was pleased to see many students take on the role of the characters and be confident enough to change the outcome. You and the actors made the student feel confident enough to take responsibility for the characters actions without making them feel vulnerable. Your drama and facilitating meant that students who are not usually very engaged were playing a very big part in the lesson. They enjoyed having you very much and are now inspired to make their own forum theatre piece!" Should you wish to have Speak Out! at your school or would like to find out more about the project then please email jen@blueelephanttheatre.co.uk or call 020 7701 0100 to speak to Jo or Jen.